Do you remember when the internet had a collective “Aha!” moment over smoothie packs? Maybe not if you’re not looking at food online 24/7 like me, but believe me when I say the world changed a little bit when people figured out that it was a lot easier to pre-make individual baggies of their smoothie fixings instead of pulling out each separate ingredient every time they wanted to whip up a nutritious drink. 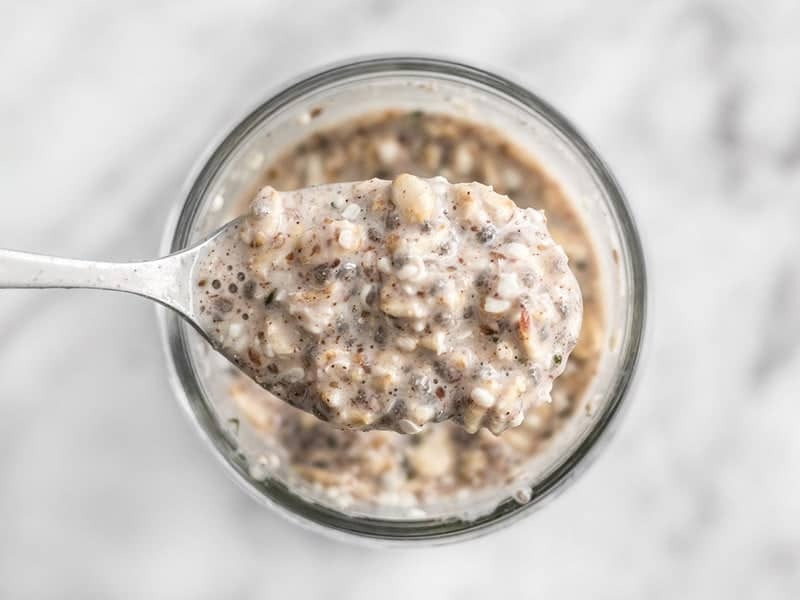 Sometimes the simplest ideas are the most easily overlooked, which is why I’m sharing my Make Ahead Seeded Oats with you today. It’s the same concept as smoothie packs, but with oatmeal. 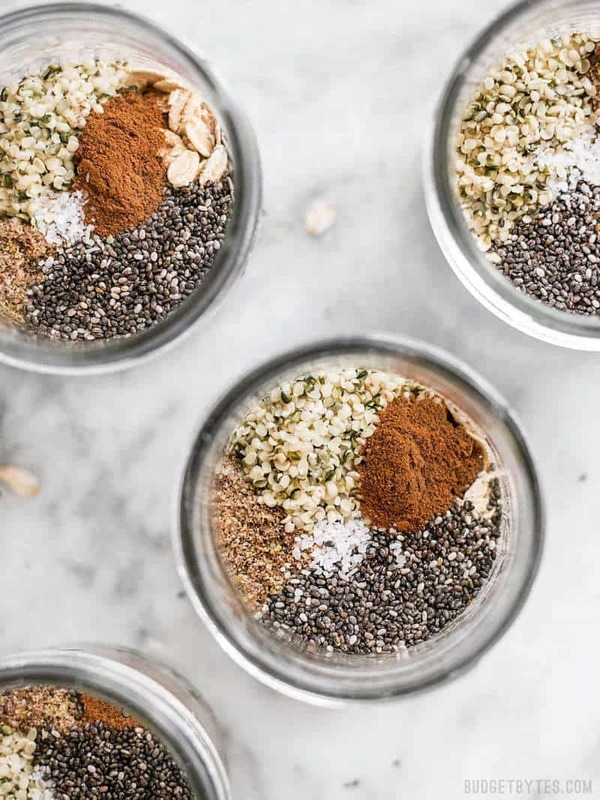 Instead of pulling out ten different ingredients to make an epic bowl of oats every morning, take five minutes to pre-pack a week’s worth of oats with your dry add-ins so that each morning you can simply dump them a bowl, add liquid, and microwave until hot. I love adding a bazillion things into my oats, so this definitely saves me time and makes me resist the urge to just eat toast. The best part? You can eat your Make Ahead Seeded Oats hot or cold and I’ll give instructions for both below. You can eat them as plain or dressed up as you’d like and I’ll give ideas for fun add-ins that I enjoy. This is a “concept” post rather than a recipe, so I’m not doing a price breakdown. 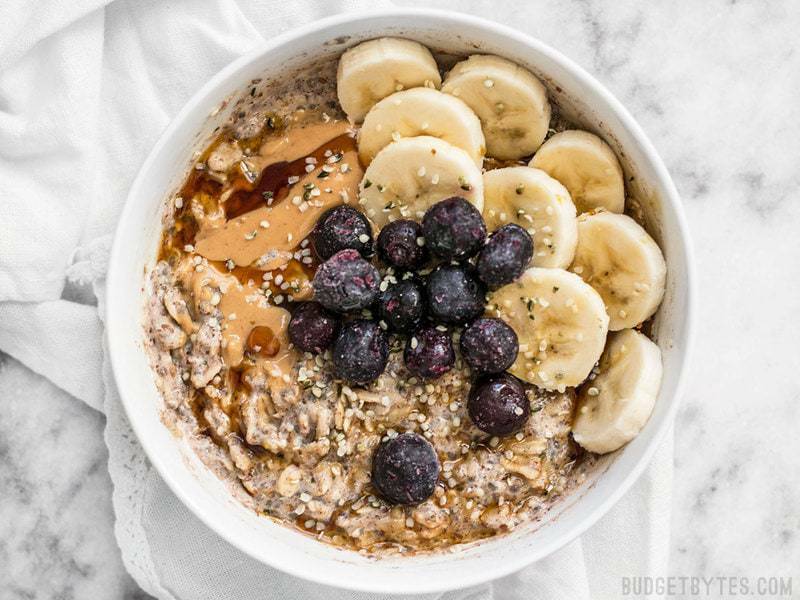 My bowl of oats changes every morning based on whatever I have in my pantry or fridge that needs to be used up, but the basic outline is below. I’d love to hear what your favorite oat add-ins are, so leave your own special mix in the comments at the bottom of the post! 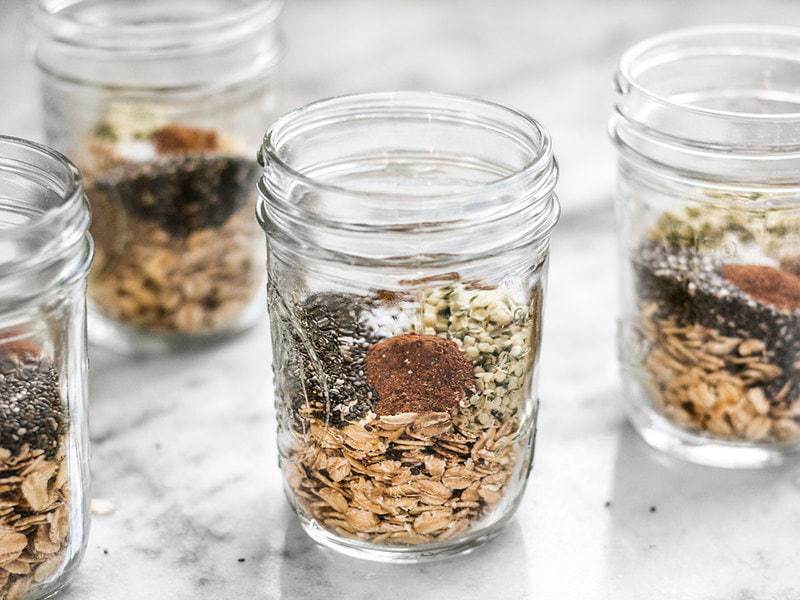 Preparing individual oat packs with seeds, seasoning, and other add-ins, like these Make Ahead Seeded Oats, makes having a healthy breakfast fast and easy. Divide dry ingredients between four containers (zip-top bags, reusable plastic containers, or glass containers with lids). About 1/3 cup oats, 1 Tbsp flaxseed, 1 Tbsp hemp seeds, 1/2 Tbsp chia seeds, 1/4 tsp cinnamon, and a pinch of salt for each. If you are using a dry sweetener, like sugar, brown sugar, or stevia, you can add them to the dry mix. Store in a cool dry place indefinitely. To prepare the oats hot, add 2/3 cup water, milk, or non-dairy milk and stir to combine. Microwave on high for one minute, stir, then microwave in 30 second intervals until thickened. Let the seeded oats sit at room temperature for about 2 minutes to thicken further. Add in any extra items (fresh fruit, peanut butter, syrup, etc.) just before serving. To prepare cold oats, add 2/3 cup water, milk, or non-dairy milk, stir to combine, then refrigerate for 8 hours or up to 3-4 days. Stir in any fresh add-ins just before serving. Adding a pinch of salt to oatmeal is a game changer. It really punches up the flavors and makes the oats seem very rich. I like to use a 2:1 liquid to oats ratio, even with the absorbent nature of the chia and flaxseeds. 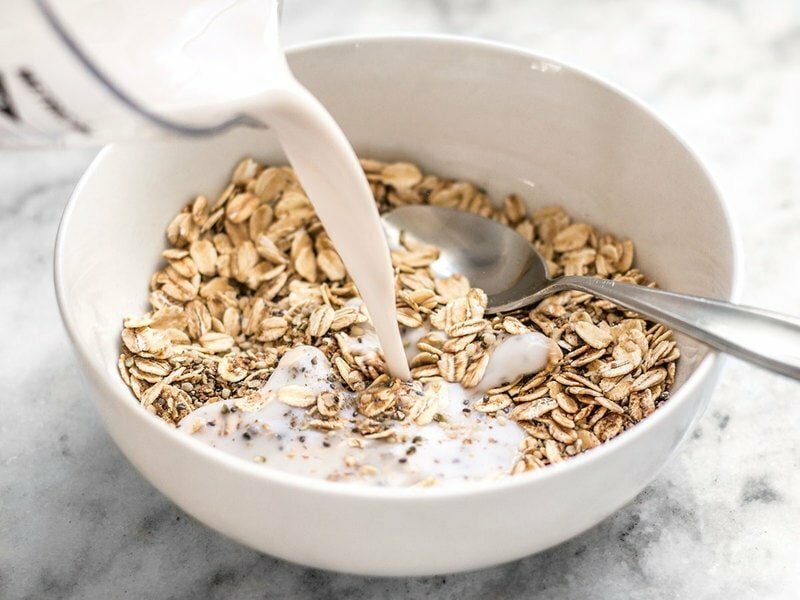 So, when I use 1/3 cup rolled oats in my oatmeal packs, I add 2/3 cup liquid (water, milk, or non-dairy milk) before cooking or before overnight cold-soaking. You can also pack your oats in snack-sized zip top bags, or reusable plastic containers. 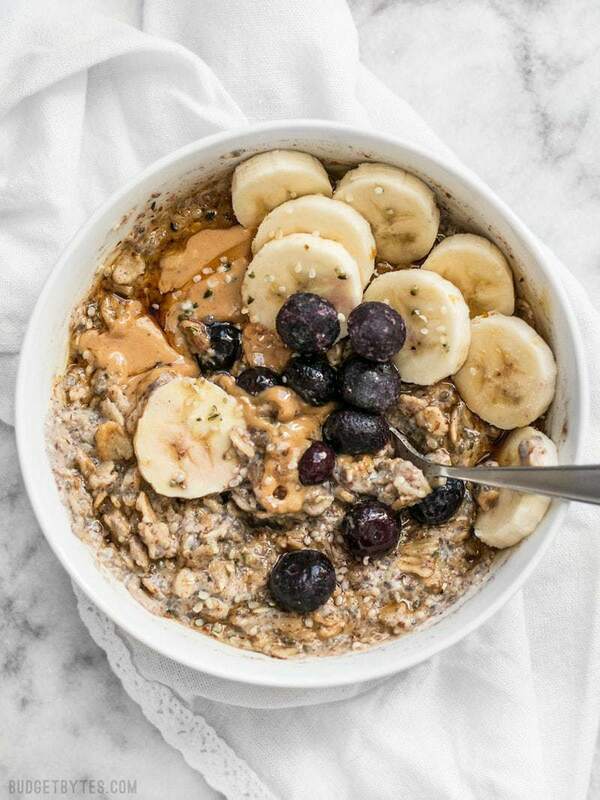 There are two things that really take a bowl of oats to the next level: a pinch of salt, and some sort of fat, whether it be coconut oil, peanut butter, or regular butter. PB is my favorite du jour, but coconut oil is my second fav. Hi Beth! I saw that you are currently using oat bran for this, and would love to know how you prepare it. I want to mix up my oatmeal a little, and am thinking a mixture of rolled oats and oat bran could be nice. I have never used oat bran before. Should I change the liquid ratio or cooking/soaking time? I always either cook my oats on the stove, or make overnight oats. Hi Elise! Oat bran is SUPER easy. It cooks up in the microwave just like rolled oats, just add water and microwave for about 1.5 minutes. :) I use the water ratio listed on the package, which is 1:4. They don’t need any soaking because I’m eating them hot instead of cold. I hope that answers your question! For hot oatmeal, I like to make it a little bit thinner and stir in a spoonful of crunchy PB, then sprinkle with cocoa and a bit of brown sugar. It’s like a breakfast Reese’s cup! Another option is to stir some diced apple in before cooking, then top with some more after, so you have both soft and crispy apple bits. I do this too! So good. Other optional add ins are: pumpkin seeds, unsweetened cocoa powder, grated carrot (for a carrot cake vibe). I use quick oats and at work we have an electric kettle and no microwave in the office so I just heat up the water first and then add it to the oats, stir and let sit for a few minutes to cook and then enjoy :). But, if I add frozen fruit after cooking, wouldn’t it be still cold? I actually just stir in yoghurt. But maybe I should explore other add ins. These look so good! I’m still stuck on pulling out each ingredient every time I want oats, so i’ll need to try this. My favorite combination is pretty simple: honey, cinnamon, flax meal and walnuts. I have been tempted to try hemp seeds, but haven’t yet because I’m unsure of the taste. Is it similar to another seed, or does it have a distinct taste? Hi, I would say hemp seeds are like an earthier sesame seed! I found myself doing this so much a few years ago then quit. I think it was because i quit wanting oatmeal. Been craving it, so should add it back. Last time, I would do maple syrup and brown sugar, chocolate chips or those water flavorings to make sickeningly sweet ones . Now, I would do more spices and dried fruits. My favorite measure it out and then microwave (was faster for just one person) is to do crystallized ginger, allspice and nutmeg. Sometimes even throw in some pumpkin puree. No, I don’t have a sweet tooth still. I’m with you on the peanut butter! I also like to add either dried blueberries, mini chocolate chips, dates, protein powder, or peanut flour. Chopped fresh cranberries and slivered almonds are great too. You need to cook the cranberries with the oats though to mellow them slightly.